You wouldn’t believe what I was working with towards the end of 2016 to March 2018. Our move to Bromley made sense, as we had a baby coming in months and needed to get out of the area we were in, but the actual property wasn’t quite what we needed. We rushed it and ended up with problems like the driveway and the fact that we lost so much space that my music and book collection had to go into storage. Around that time, I’d just got serious with my ecommerce business and needed a proper office to focus. It wasn’t happening. I had a giant trunk full of eBay stock, labels, jiffy bags, and a corner of the front room dedicated to Amazon stock. As time went on, that space actually shrank as that baby needed to take over more and more of the flat. As I’ve discussed thoroughly on here, the game done changed. I’ve got hella space now. There are so many rooms, and one of them just so happens to be my office. Allow me to take some time to guide you through all the greatest in this space of mine, and the areas where I need to make improvements. I’ll make a shopping list as I go. Please note that I managed to fit all of this stuff in my last home (a snug two-bedroom flat). We’ll start with the main attraction, the iMac. This has served me well since the end of 2014 and continues to be my most helpful companion. 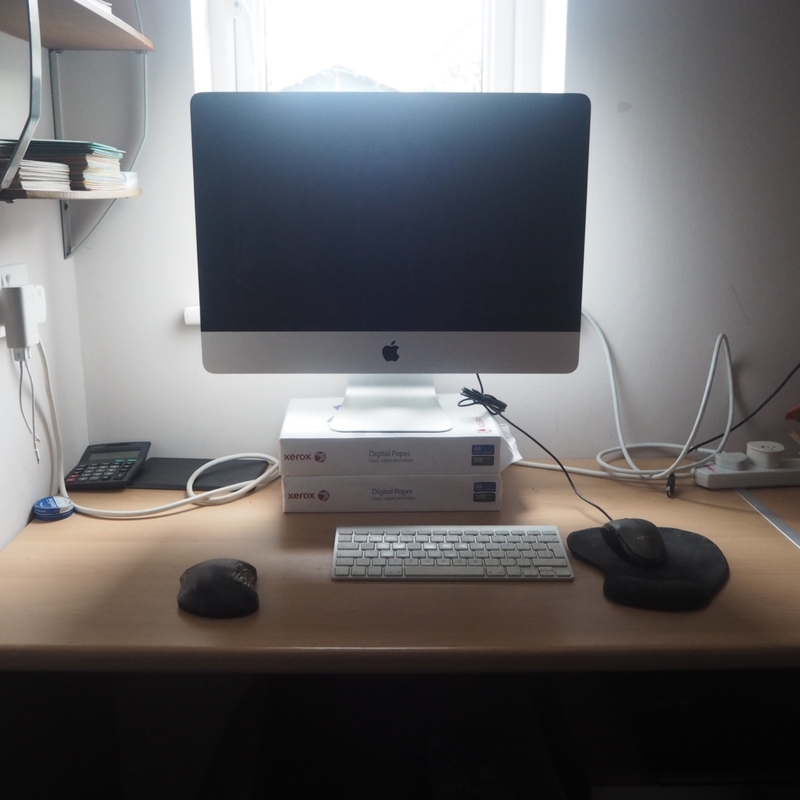 I used to have a really good monitor stand, but this Mac used to sit on a table with no protection behind. I feared I would have clapped it down one day and I’d still be crying years later. The speakers on this are booming, but I used to work in an actual recording studio, so I need to think about some weighty ones to make this section perfect. My mousepad is old. I can’t remember where I put my Apple Magic Mouse. My elbow pad was damaged over a year ago. All of that needs to be dealt with too. Oh, and I broke my iPad case (cracking the screen in the process). I could do with a standing one to make it a little more useful. If you work a corporate job and you don’t pocket stationery, what are you even doing there? I’m stocked up on all types of goodies on this bottom of three shelves. It’s where I keep my spare calculators, stapler (and enough staples to see me through to 2021), pens. Things that I actually bought on this shelf include a small set of scales, a few power packs and business cards. I’d say that this section is looking good and I don’t need to make any additions to it yet. 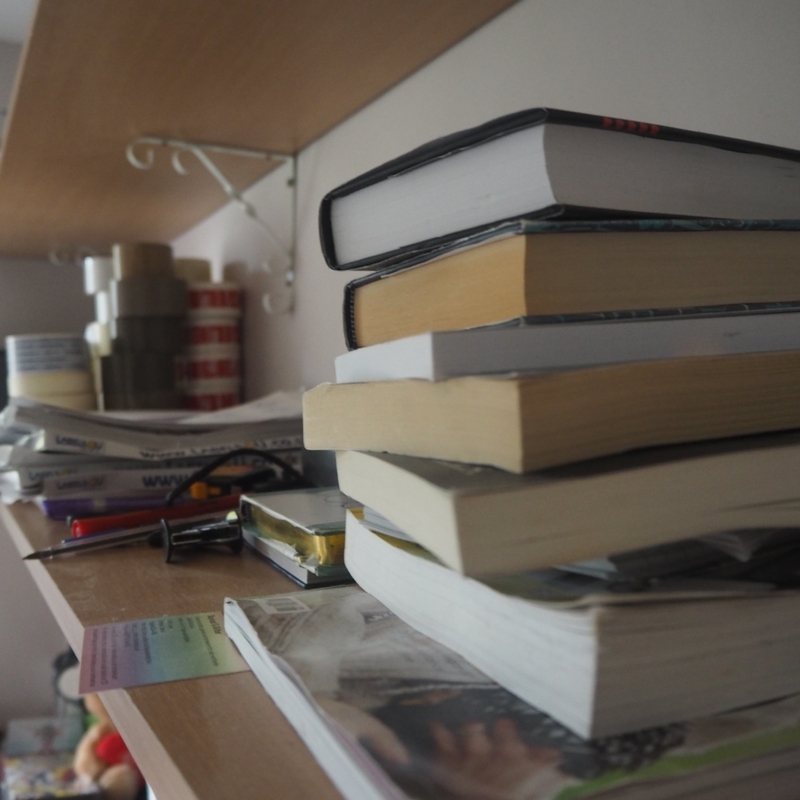 There’s no need to over-clutter things, so let’s just keep things how they are. Going up a step and we have my Brother printer, along with all of the things that go along with it. 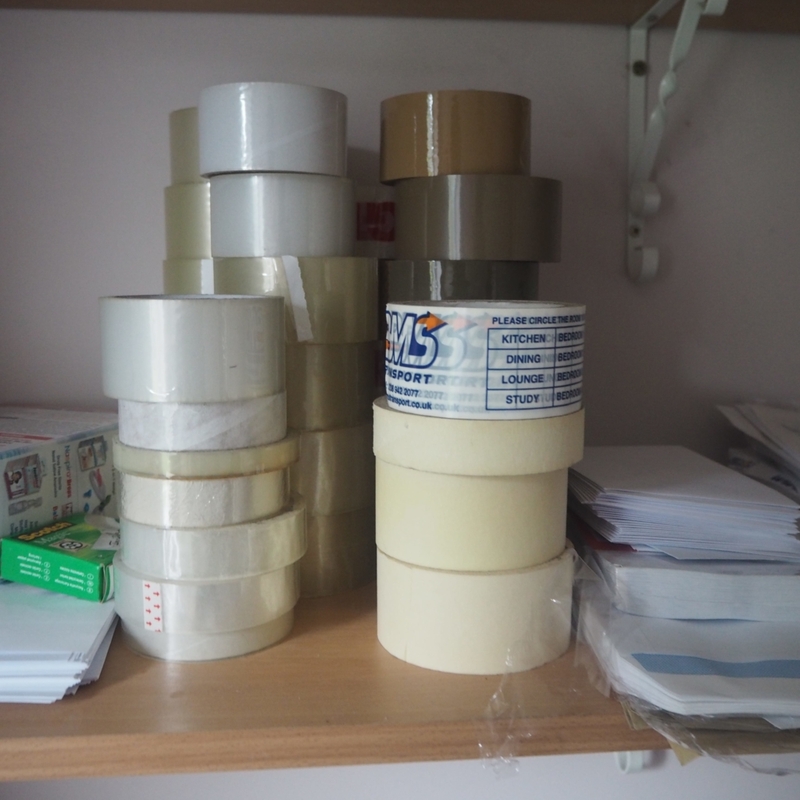 I’ve got a whole selection of tape (of which I probably only parted cash to get the brown ones), lots of paper, envelopes, plenty of labels in various sizes. I’ve then got lots of extra pens, scissors, a tape measure, a few books and notebooks. Standard stuff. Again, I think that this is all in order. I don’t really need to do anything here. I’ll definitely need to re-up on the brown tape soon, because I go through ridiculous amounts of that. The second shelf is all under control. Let’s take things to the top. 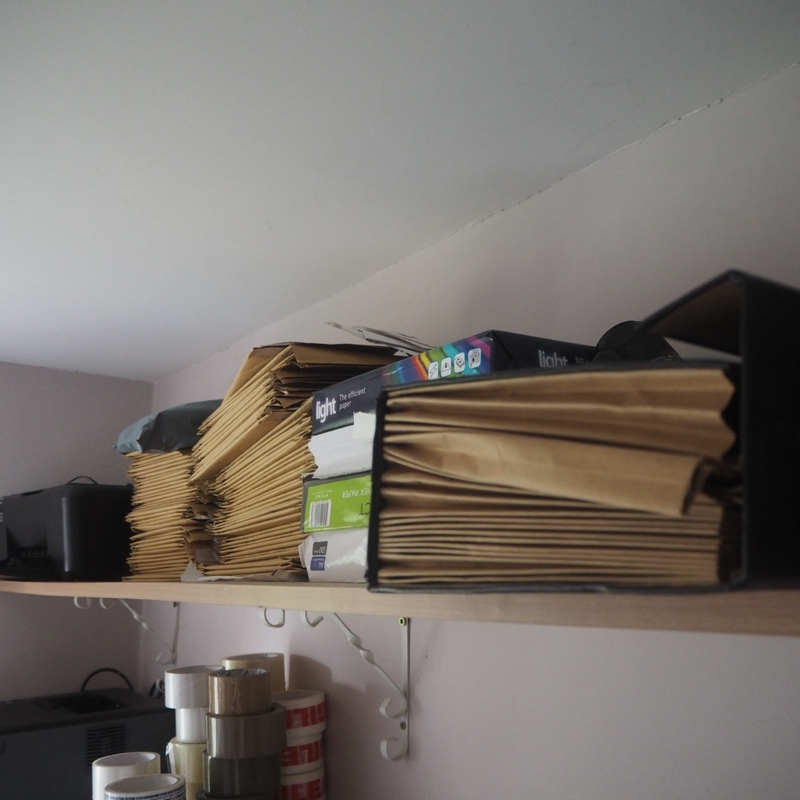 That’s where I keep my good, actually bought jiffy bags (the ones that get used are all recycled and out in the garage), and the spare paper. 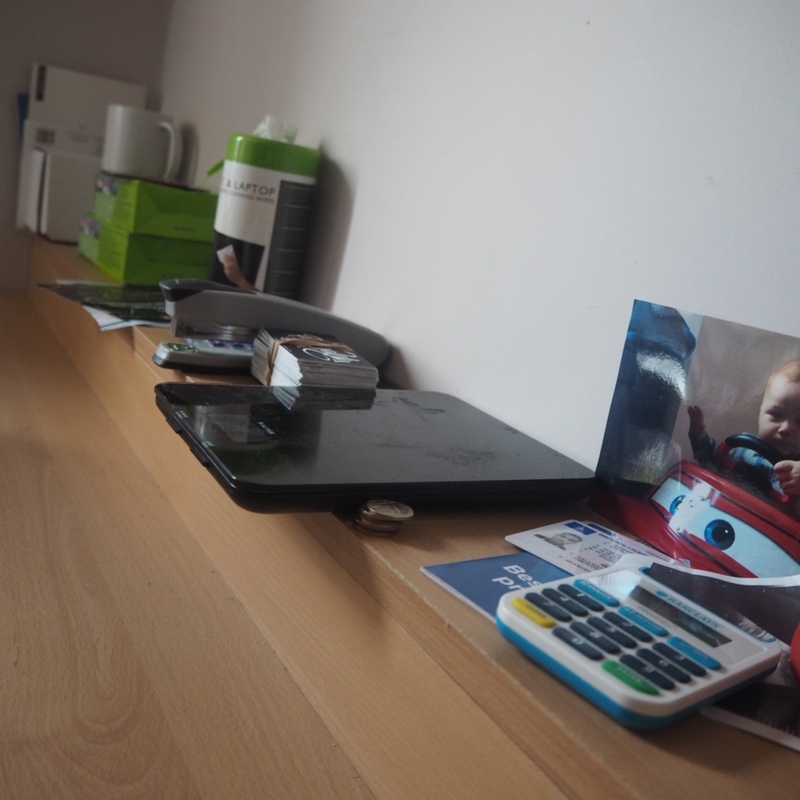 I’ve also got a couple of external hard drives sat up there. They’re full with nothing but music and haven’t been touched since the end of 2015, so I really need to do something with those. 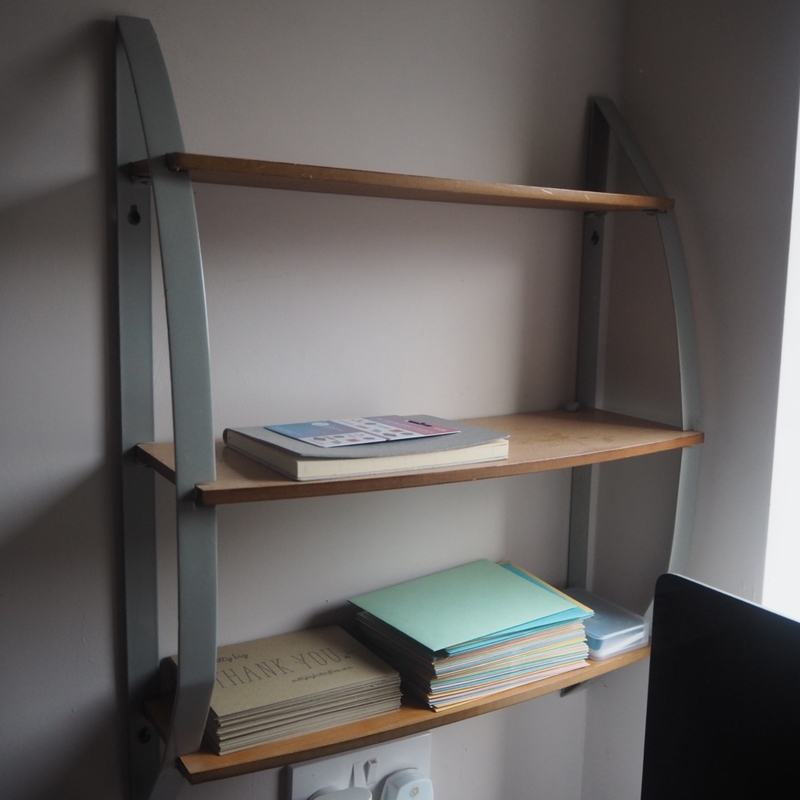 Aesthetically, the top shelf isn’t upsetting anyone, so it can stay as it is. The one thing I need to do is figure out what to do with the other printer. 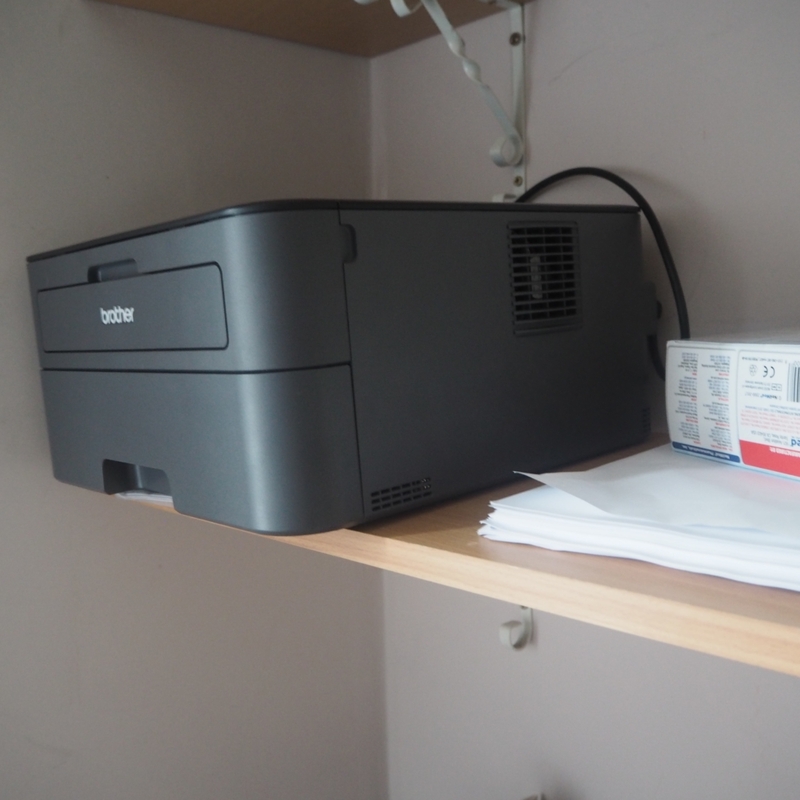 It’s a colour one with a scanner, but we haven’t used it for printing since the got the Brother. I’ll probably get rid of it, but I’m sure I need to be certain that I won’t ever need to scan a single thing ever again. I keep things all the way organised. 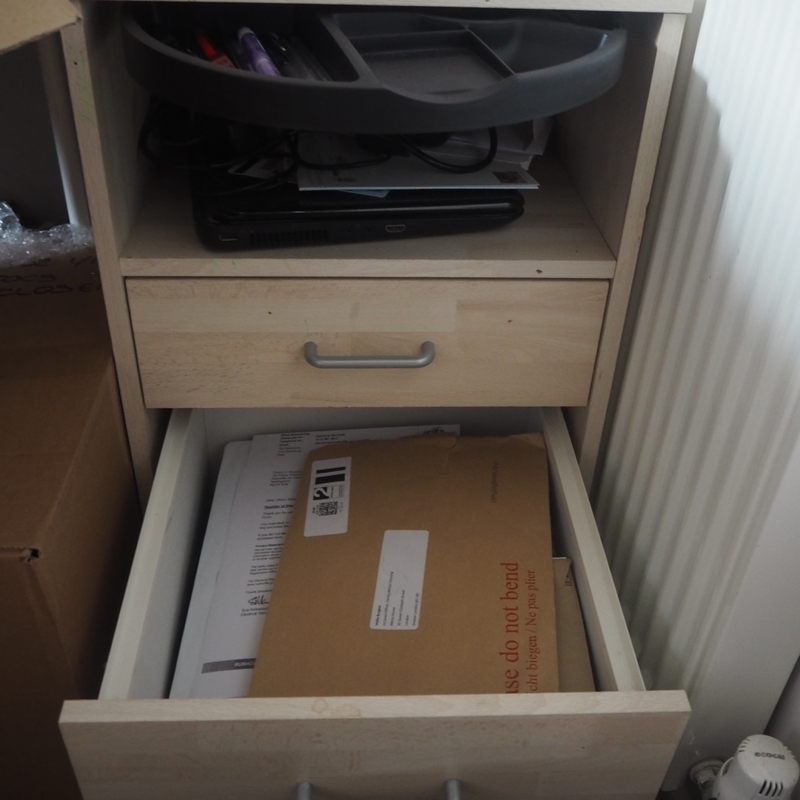 When we moved in, they left us a nice, small chest of drawers and it’s ideal for all of the work and personal paperwork I need to keep around. There’s a few bits of stationery in there too, simply because it has a secret little compartment that makes you want to make use of it. This is staying as it is. No need for any improvements.It’s doing its thing. The bonus shelf section sits right next to the Mac station and it contains nothing but XO & Quin envelopes, because they look so damn clean. I don’t think we need to do anything to this section. It’s just there jamming, looking pretty. One of the chairs was in there when we got there, and I got a second cheap one from Argos in there straight away, because I have helpers in there. However, neither of them are any good. Decent office chairs are pricey and I didn’t appreciate this until recently. Both of them need to get upgraded, especially since Hollie’s stunting on me with her fancy office chair in her office (fka the small spare room). We’re lacking in this department. It’s looking awfully flat in here, because I really haven’t put the effort in. It definitely needs some paint, and I’m never going to find the time for that. I’ve got some decent prints sat somewhere, so I need to get them out. One thing I have done to bring some colour is by introducing my old (2012-early 2016) spare room vibes by with a trio of records on the wall. It was an accident that these were the ones I decided to display and that they were so well themed together. They are as follows: Wiley – “Playtime is Over”, T.I. – “I’m Serious”, EPMD – “Strictly Business”. Playtime is Over. I’m Serious. Strictly Business. 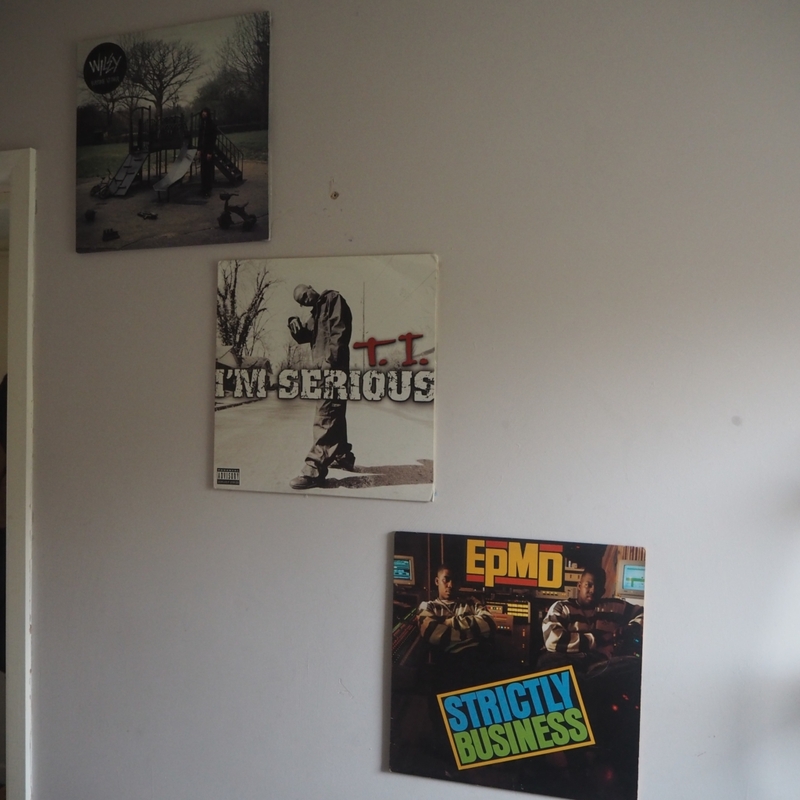 I got rid of my Tiger record frames two moves ago, so they’re just Blu-Tack’ed up there at the moment. I’ll get that sorted. I think I need to sit back and look at the situation before I think about adding anything else to it.